ROCKLAND, Maine — The owner of a weekly publication that serves Knox, Waldo and Lincoln counties announced Monday afternoon that he planned to have the former Village NetMedia newspapers back on the streets in Rockland, Camden and Belfast by next week. Reade Brower, founder and president of The Free Press, announced on his website that he had signed a letter of intent March 12 to purchase the remaining assets of Village NetMedia including all Village Soup assets and the names of The Courier-Gazette, the Republican Journal, Capital Weekly, and Bar Harbor Times. 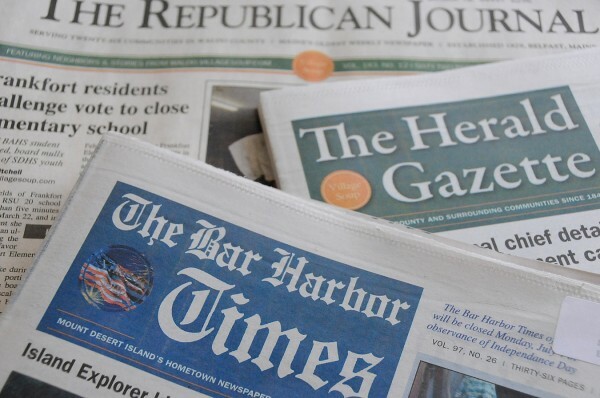 Brower said he expects the sale to be finalized within days and expects to have newspapers back on the street in Rockland, Camden and Belfast as early as next week, two weeks at the most. He met with some of the former Village NetMedia employees Monday evening to begin to solidify plans and staffing, according to the company’s website. Brower said Monday night in a telephone call that he decided to step forward to save the papers for these communities. Brower said he would try to hire back many of the former employees of Village NetMedia. “There’s no reason to look anywhere else,” he said. He said he would discontinue the Bar Harbor Times and the Capital Weekly. Earlier in the day, Village NetMedia founder Richard Anderson said the assets of the company were with The First bank of Damariscotta. Anderson announced Friday that he had ceased operations of all four of his publications — Village Soup Gazette in Rockland, Village Soup Journal in Belfast, The Bar Harbor Times, and the Capital Weekly in Augusta — as well as the online villagesoup.com. Those assets include the names of the papers and equipment. The archives, old newspapers and photos are also assets. Fifty-six people had been laid off from the closures. The Republican Journal was founded in 1829. The Courier-Gazette started in 1846 and the Camden Herald in 1870. The Bar Harbor Times was started in 1914. The Capital Weekly was started in 1996. The Free Press started in 1985. The former employees at Village NetMedia’s office in Rockland were packing their belongings Monday, saying farewells to longtime friends and colleagues and filling out online applications for unemployment benefits. David Grima, team leader for the state’s CareerCenter rapid response team, met Monday with the laid-off employees at the Rockland office. Grima said he was able to offer the people some advice based on his own experience. Grima had been editor of the weekly Camden Herald until June 2008 when Village NetMedia purchased the Herald along with other newspapers previously owned by Courier Publications. He lost his job in that acquisition. “It’s been an enormous help. I’m not just reading out of a book, I’ve experienced it and can tell them that there is life after unemployment,” Grima said. He provided them information on how to apply for unemployment benefits, which the staff got busy doing on the computers at work before they left for the last time. The laid-off workers should receive their first unemployment checks in three weeks, he said. The maximum amount of unemployment benefits is $366 per week plus $10 per week for every dependent if the other spouse is not working. The workers also were informed about training opportunities available and how to go about applying for new jobs. He said several people had already expressed interest in getting training to become certified nursing assistants. He said there is a great need for more CNAs in the state. “Health care is the one occupation that has grown during the recession,” Grima said. For Dagney Ernest, the arts and entertainment editor for Village NetMedia, it was a somber day. Ernest had started writing reviews for The Courier-Gazette of Rockland in 1985 and came on as a full-time employee on Memorial Day 1996. “The Courier has been a big part of my life. This has been the only and I expect the last newspaper job I will ever have,” Ernest said. She said besides the loss of jobs for her friends and co-workers she expressed concern about the loss of historical information and papers with the closure of the papers. As workers were carrying their belongings to their cars and trucks in the parking lot, Bonnie Fish of Hope, a longtime reader of The Courier-Gazette and its successors, said she was shocked with the announcement. She said everyone she has run into over the weekend has been talking about the closure of the newspaper. Inside the Village NetMedia offices on Monday, Anderson said he had been negotiating with a group of investors for four to six weeks to help keep the company operating, but that even though both The First and the investors were coming close, they could not reach an agreement and Friday afternoon he made the decision to cease operations. He said there was simply not enough money to meet the next payroll and he would not ask people to work and then not be paid. Anderson said he feels terrible about the outcome and its effect on so many people. He said he was even more frustrated because he felt that the change in the format of the papers on Dec. 1 — to focus more on analysis and in-depth stories not seen before online — was well received by readers and advertisers. He said circulation had begun to rebound. Anderson started his online community center in 1997 and expanded to open two newspapers — the Knox Couty Times in Rockland in 2003 and Waldo County Citizen in 2004 in Belfast. He closed those papers upon acquiring The Courier-Gazette, The Camden Herald, the Bar Harbor Times and The Capital Weekly in July 2008. He also closed the Waldo Independent upon its purchase in 2008. The Village NetMedia founder said he paid a reasonable price for the papers in 2008, although he declined to say how much. “Nobody did anything wrong,” he said. He said there were seven newspapers in the Rockland to Belfast market and even in the good economic times when he made the purchase, the local population and advertisers could not support that many newspapers. He said the economic recession resulted in the loss of 45 percent of real estate and automobile advertising for the company. He said the papers were not able to recover adequately from this new financial reality. “The [media] industry is struggling worldwide. The entire industry is trying to figure out how to sustain professional journalism,” Anderson said.